I made this yesterday, so good and so easy! Glad you enjoyed it! It's one of my favs! I am from a Sicilian family and grew up eating my Grandmother's lentil soup. Yours sounds similar to ours. She never added tomato paste or any meat. Signs of the times were that good Catholics served this on Fridays because we were unable to eat meat during those years. I will try your recipe to give some variety to my recipe. Sounds delicious. Funny, my mother didn't cook the lentil but I do. My children grew up eating this and split pea soup. Both served with a helping of spaghetti. Whenever their friends asked them what they were having for dinner, the friends would respond, "Ewwwww, that's gross!" My kids would laugh and tell them how great it was. This Mama would just smile. Do you use dried lentils and does it matter what color/type? I do use the dried lentils. 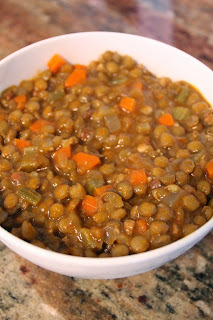 I use the brown lentils, and haven't tried any other variety, but I think you could. Made this today. Perfect for this crisp, gloomy, southern California weather. Thanks Tasha! It's a great recipe she made. Losing a grandma is hard...it's like the passing of an entire generation in some ways. You can salt and pepper it as needed. I find the bullion tends to add salt, plus I put a ton of parmesan on mine! Haha. But you should adjust to your salt loving level! I love this recipe, thank you for sharing! My Nona made this. She added bay leaf, Italian seasoning, salt and pepper (no stock, just water). Served over broken spaghetti. Grazie!! From one Sicilian to another! Delicious! I will make this again. This is the second time I made this soup. I will make it again and again! Going to try this today subbing ground beef for the ham. Fingers crossed. I love this recipe. Been making it since this posted. I have only used Red Lentils and have no idea why. It's been fabulous. I love making this with kielbasa, honey baked ham etc. LOVE THIS RECIPE! I have made this soup several times. It is easy and delicious! Thank you!! I came from a Sicilian family also this is similar to my grandmother's recipe but we use either Italian sausage or ground beef for meat and insted of tomato puree we do stewed tomatoes she likes hers more soupy and sometimes adds ditalini pasta but I like mine more hearty like pictured. I made this yesterday and used a smokey bacon. It was delicious!!! Next time I will cook the bacon first and remove some of the drippings, but my family loved this!